Interlaced ‘L’s enclosing fleur-de-lys and with dots above and below. 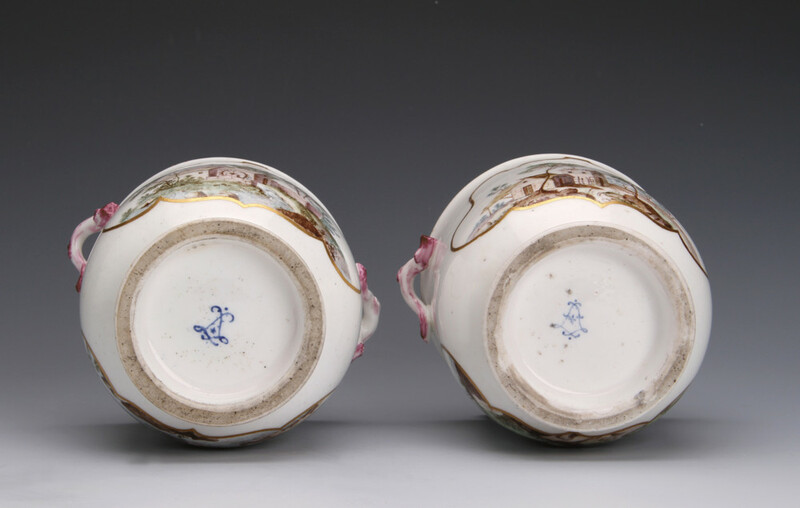 Finely painted with four panels of rustic houses in landscapes within shaped gilt cartouches. 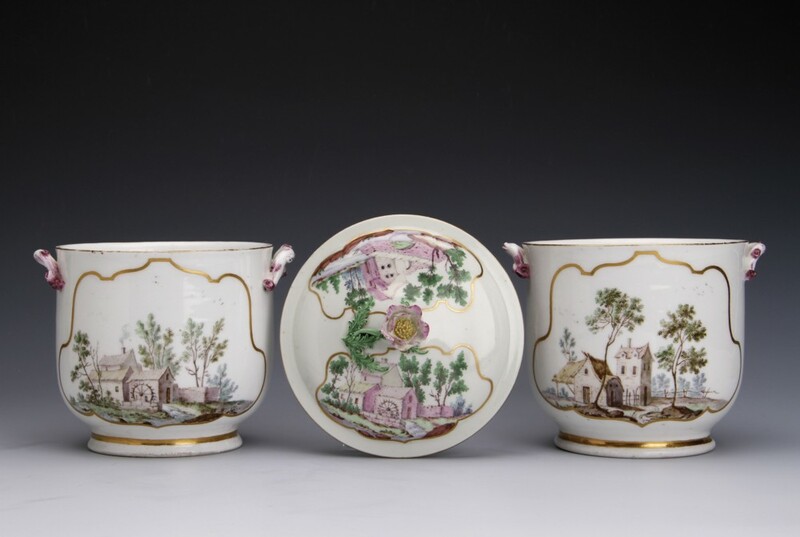 When these were sold by Sotheby’s in 1960 the catalogue entry states that each was fitted with ‘a Worcester porcelain cover of the early period imitating the style of Vincennes, with flower knops’. We have managed to track down one of these Worcester covers which had been sold in the Zorensky collection, part I, Bonhams, 16.3.2004, lot 33. The painting is painstakingly copied from the Vincennes indicating that the Worcester artist, or perhaps a painter in a London decorating studio, must have had these pieces on his bench in front of him. 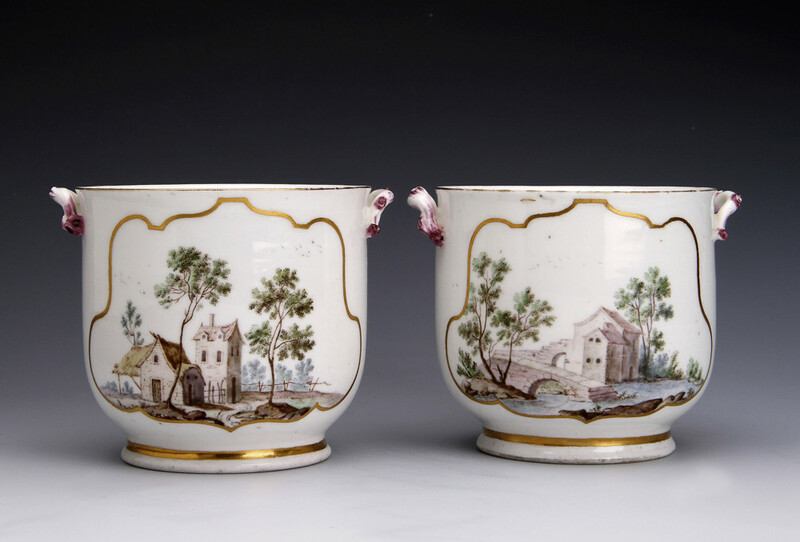 Since the Worcester covers date from around 1758, this makes these pieces, dating as they do from around 1750, the earliest pieces of Vincennes porcelain that one can be certain were in England in the 18th century. 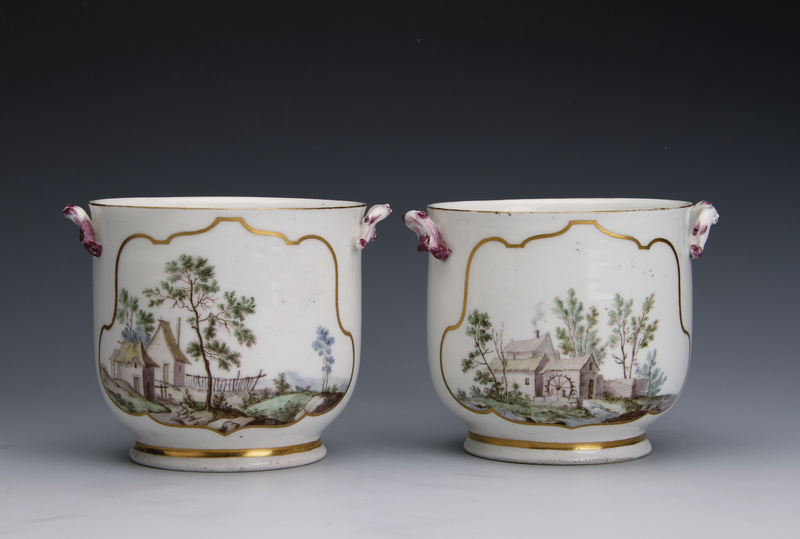 The form of these coolers is a version that can sometimes be found with Meissen-style decoration of the late 1740s and the simple crabstock handles predate the rococo scroll handles that were introduce by the silversmith Jean-Claude Duplessis. The painting is particularly fine and whilst it is impossible to attribute with any certainty it is tempting to make a connection with Armand l’aîné who later became so famous for his bird painting. The treatment of the trees is similar to that found on his work in the mid 1750s and the elaboration of the mark of interlaced ‘L’s is reminiscent of the mark that is so distinctive of Armand.